The project runs a MQTT client application which initiates TLS handshaking and then communicates securely with a Mosquitto broker. As outlined in “Introduction to Security and TLS (Transport Layer Security)“, I have selected mbed TLS because its licensing terms are very permissive (Apache). Get mbed TLS from https://tls.mbed.org/download (I recommend the Apache version as it is permissive). 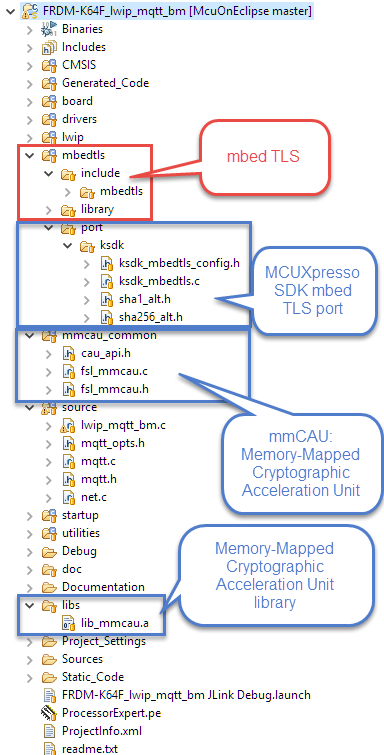 This completes the files and settings to add mbed TLS to the project :-). The communication flow is not any more ‘send one message, receive one sent_cb() callback). Because the TLS layer is doing the handshaking, multiple messages will be transmitted and received, so the call backs need to be separated too. Without the TLS layer, the communication flow is more synchronous, and received messages are directly passed up to the application layer. With the TLS between, there is the need for an extra buffering of the incoming messages. 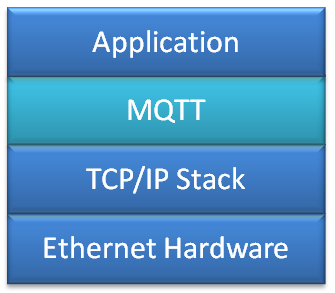 Messages to be sent from the MQTT layer are already buffered in the non-TLS version. To ensure that they are sent, an extra function mqtt_output.send() has been added. 💡 I’m not very happy with that mqtt_output_send() method, but that’s the best I was able to come up to get things working. I might need to refactor this. To make the above working, I had the tweak the existing MQTT implementation with comes with lwip. Several things should be considered for a general refactoring or done with extra callbacks. I might be able to implement and improve it over the next weeks. The following sections explain the implementation in more details. 💡 Notice that with I’m using MBEDTLS_SSL_VERIFY_NONE. I need to change this in a next iteration, see “Tuturial: mbedTLS SLL Certificate Verification with Mosquitto, lwip and MQTT“. With ethernetif_input() it polls for any incoming TCP packets. With sys_check_timeouts() it checks for any timeout and for example sends periodic PINGREQ messages to the MQTT broker. In the MQTT_STATE_CONNECTED it calls mqtt_tls_output_send() to send any outstanding MQTT packets. It uses mqqt_recv_from_tls() to poll any incoming TCP packets. to establish a connection with the server. At this state, the only difference between TLS and unencrypted communication is that it uses uses a different port (8883 instead of 1883) and that it stores the SSL context in the client descriptor. Inside mqtt_client_connect(), it will directly call the tcp_connect() function. In TLS mode, it configures the special call backs for tls handling (tls_rcp_recv_cb() and tls_tcp_sent_cb()) and moves the connection state into TLS_HANDSHAKING mode. 💡 Note that the error handling is not completed yet! The interface to the network/lwip layer for mbed TLS is implemented in net.c. In order to get MQTT working with TLS/SLL and lwip, I had to deep dive into how TLS and lwip works. I have to admit that things were not as easy as I thought as both MQTT and TLS are new to me, and I only had used lwip as a ‘black box’. The current implementation is very likely not ideal, not that clean and lacks some error handling. But it ‘works’ fine so far with a local Mosquitto broker. Plus I have learned a lot new things. I plan to clean it up more, add better error handling, plus to add FreeRTOS in a next step. Will see how it goes :-). I hope this is useful for you. I have pushed the application for the NXP FRDM-K64F board on GitHub (https://github.com/ErichStyger/mcuoneclipse/tree/master/Examples/MCUXpresso/FRDM-K64F/FRDM-K64F_lwip_lwip_mqtt_bm). I plan to update/improve/extend the implementation, so make sure you check the latest version on GitHub. 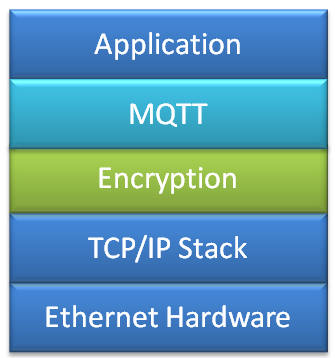 I hope you find this useful to add TLS to your MQTT application with lwip. How to add server certificate verification, see my next article: “Tuturial: mbedTLS SLL Certificate Verification with Mosquitto, lwip and MQTT“. 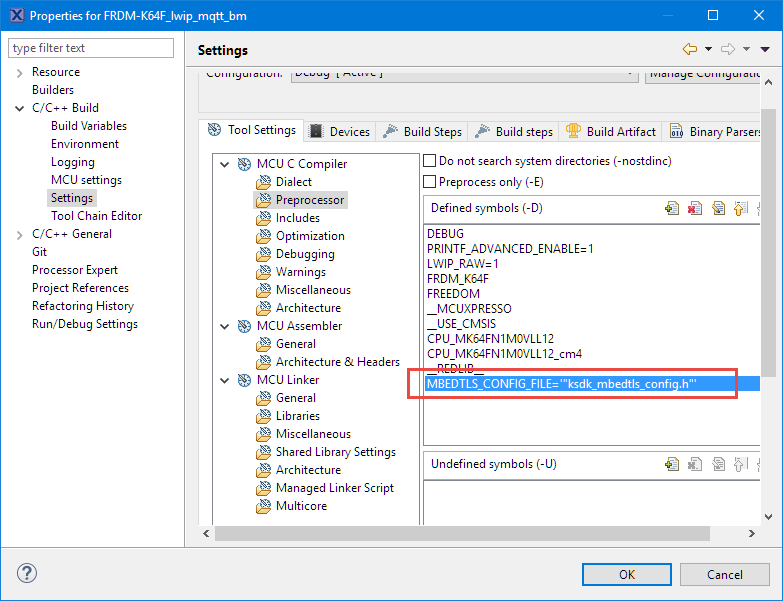 This entry was posted in ARM, Building, Cortex, CPU's, Eclipse, Embedded, FRDM-K64F120M, gcc, Kinetis, MCUXpresso, MCUXpresso IDE, MQTT, NXP, Processor Expert, SDK, Tutorial and tagged arm gcc, cryptography, Eclipse, FRDM-K64F, gnu gcc, mbed, mbedTLS, MCUXpresso, MCUXpresso IDE, mmCAU, NXP, open source projects, Processor Expert, SDK, software, software project, SSL, technology, TLS, Tutorial by Erich Styger. Bookmark the permalink. Thanks, Erich. Will have to give it ago. Have you played with FNET https://github.com/butok/FNET/ at all? Found that a while ago when looking for lwip alternatives. looks like that has mbed tls built in too. yes, I’m aware of FNET. But as it (currently?) 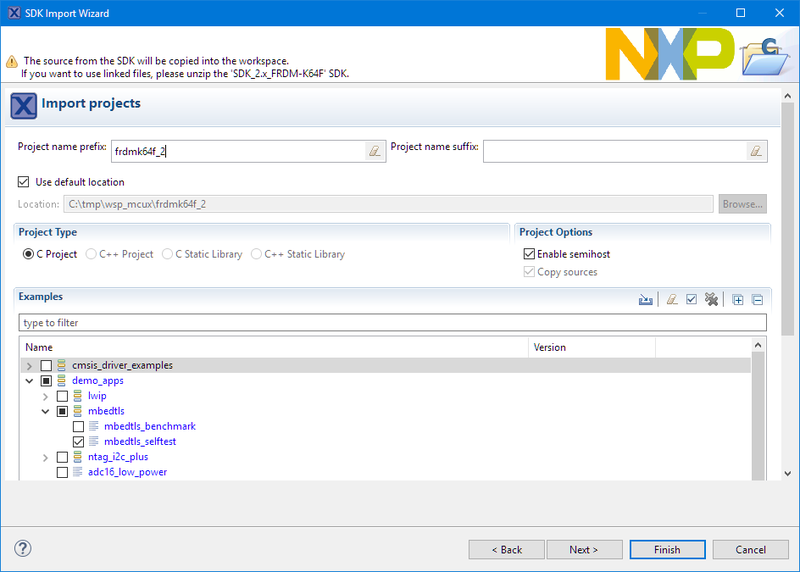 only supports NXP devices, I have not used it. lwip on the other side is much more broadly used and supported. Compliments for gettin it running ! I expect that my implementation ( MQX based ) should be a little bit simpler since RTCS give socket support with asyncronous receive and sending of the TCP/IP packets. Anyway, thank very much for all these article about MQTT and SSL : they are really inspiring and offer also a list of useful links. Thanks :-). Yes, I could have used sockets as well with lwip, but I wanted to start on the very low level, as it is easier to add a sockets layer later then to go the other way round. Great introduction! It’s very useful. I have one question about the reduce RAM usage part. MPI stands for Message Passing Interface, and that define is used in many places for buffers. It basically describes the maxiumum number of bytes which can be passed in a single message. Basically it means that the keys exchanged should not be larger than 512 bytes. 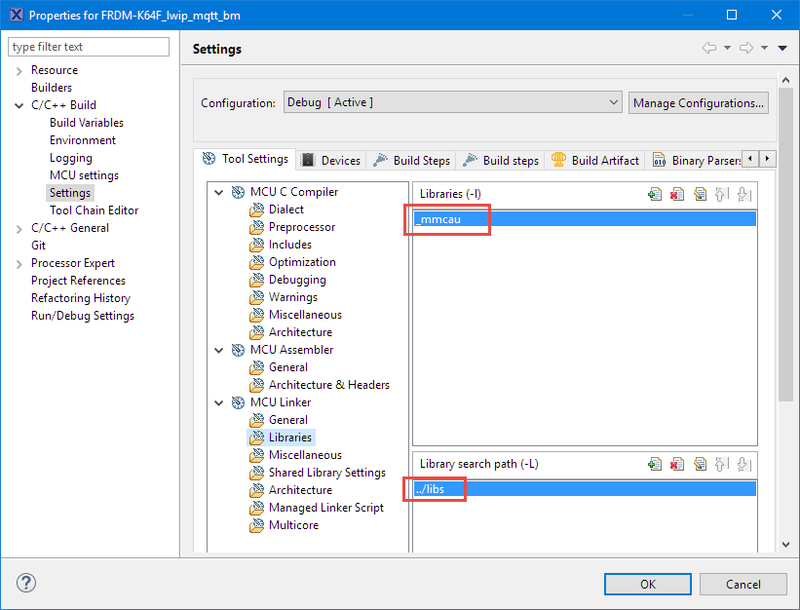 It is possible to use MQTT mbedTLS with ESP8266 ? You mean connecting from a NXP FRDM board (e.g. FRDM-K64F) with an MQTT client using mbedTLS to a MQTT server running on a ESP8266? Not done that, but I don’t see a reason why this would not work if the software on the ESP8266 is properly running the protocol. I meant connect the NXP FRDM board to a ESP8266 (over UART) and send to a MQTT broker ( AWS ) values or strings. I didn’t find any exemples in the internet using AT command that’s why I was wondering if it was possible ? I don’t see a reason why this should not work. I have done similar things (see https://mcuoneclipse.com/2014/12/14/tutorial-iot-datalogger-with-esp8266-wifi-module-and-frdm-kl25z/). Where are the certificates loaded? I didnt found where the CA, certificate and private key are passed. FYI, LWIP now supports MQTT over TLS via ALTCP_TLS. It now supports loading of CA certificate, client certificate and private key. Tested it working with Amazon AWS IoT cloud. I’m trying since months to follow your amazing tutorial step by step. I bought all materials and installed all tools on Linux, and I’m trying to connect the board with a local mosquitto broker (in my PC). 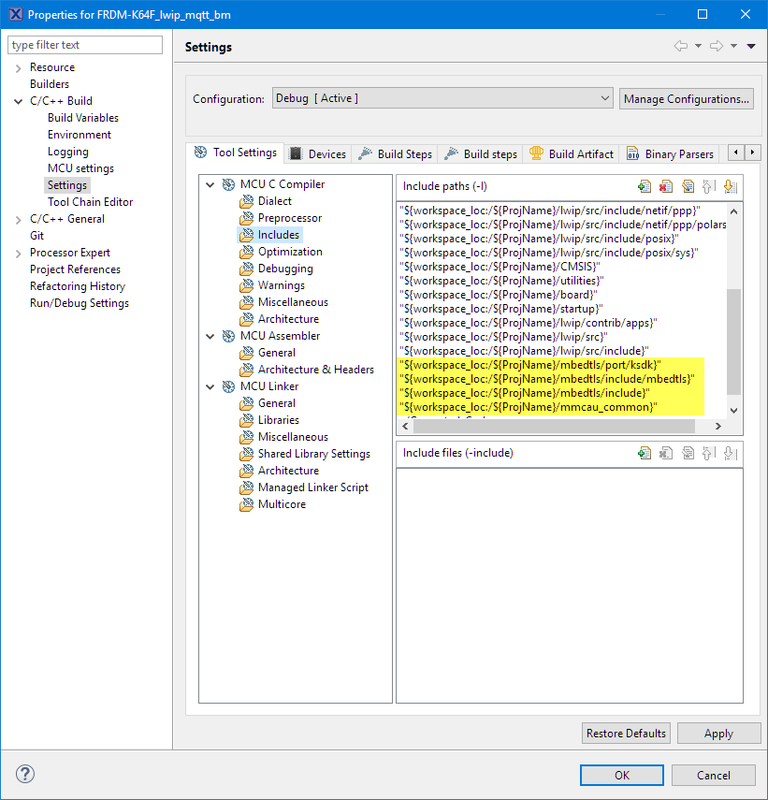 1- How to configure the board (client-publisher) with the local mosquitto broker? In “config.h” I made in /* broker settings */ CONFIG_USE_BROKER_LOCAL (1) and CONFIG_USE_BROKER_HSLU (0), and for /* client configuration settings */ I gave my PC settings in not WORK_NETZWORK. And in /* connection settings to broker */ I set again my PC settings (HOST_NAME, HOST_IP) in CONFIG_USE_BROKER_LOCAL. Unfortunatly I could not see the result becuse it was a problem in the debugging. This GDB was configured as “–host=x86_64-linux-gnu –target=arm-none-eabi”. I didn’t find any file with the name lwip_app.c! 1- I’m not working on mqtt-FreeRTOS without mbedtls but with mbedtls “FRDM-K64F_lwip_lwip_mqtt_bm”. I think, I can configure the IP address in /source/config.h file. 2- When MCUXpresso searches for a propes then it findes only LinkServer type. So I have no chance to make with SEGGER J-Link. first, thank you very much for such a good job. Do you think is it possible not to use the RNG1 Module? 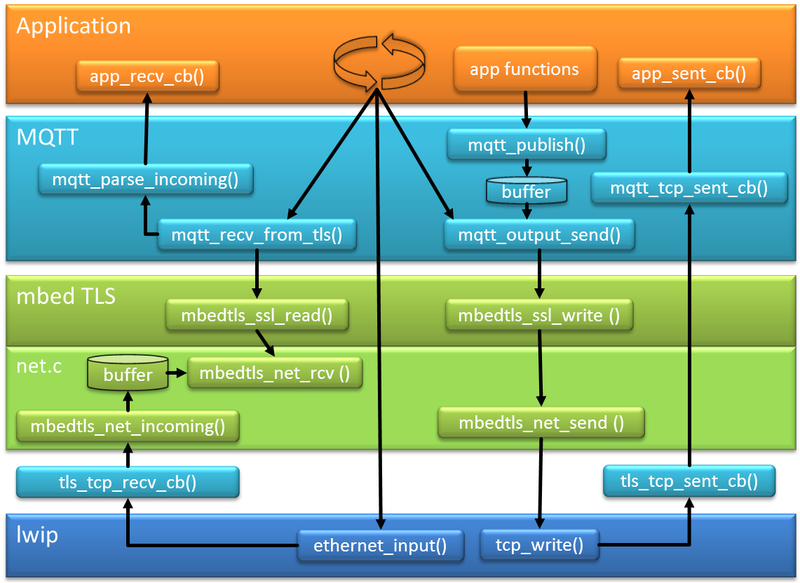 how should I modify the mbedtls_net_recv? To be more precise, I see that, porting this example in another microcontroller, the mbedtls_net_recv always has no data in the RNG1 Ringbuffer. Could you explain how it is used? In that case it means that you are not receiving the data. Have you tried to run it on a K64F as well? I’m waiting for the MCUXpresso to be available to download, then I will test on my K64F. However, I can’t understand very well the firmware. But who writes on buf? The strange thing is that with no TLS the program is perfect, so it seems that some union between TLS and TCP is missing. Search for RNG1_Putn in the project. I found what the problem was: it seems that tcp_write didn’t send data. I put a tcp_output, now it works! You can use whatever you like. The RNG1 is a simple implementation of a ring buffer, but you can replace it with your own implementation too.